Paradise found! Mosey on over to this beautiful 3 bedroom, 2 bathroom home with a backyard you will never want to leave! Pool, above ground spa, putting green, BBQ with bar seating, patio table, couch lounger and pool loungers. 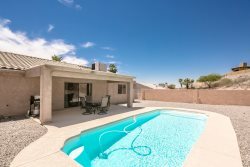 Located in beautiful central downtown Lake Havasu City, its also close to shopping, restaurants, beaches and launch ramps. We love Destination Havasu. They have taken great care of our family for many years. Rachael did a excellent job for us. We appreciate her efforts.